Meindert Hobbema (bapt. 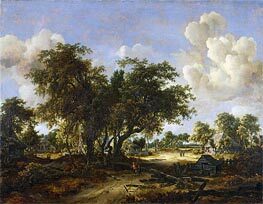 Oct 31, 1638, Amsterdam - Dec 7, 1709, Amsterdam), was perhaps the greatest landscape painter of the Dutch school after Ruisdael. The facts of his life are somewhat obscure. His chronology and signed pictures substantially contradict each other. 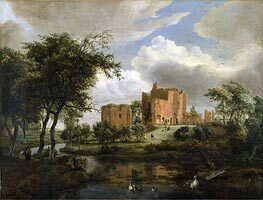 According to the latter his practice lasted from 1650 to 1689; according to the former his birth occurred in 1638, his death as late as 1709. 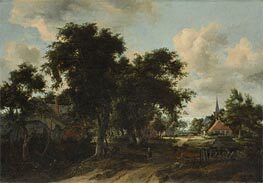 If the masterpiece formerly, in the Bredel collection, called A Wooded Stream, honestly bears the date of 1650, or The Cottages under Trees of the Ford collection the date of 1652, the painter of these canvases cannot be Hobbema, whose birth took place in 1638, unless indeed we admit that Hobbema painted some of his finest works at the age of twelve or fourteen. 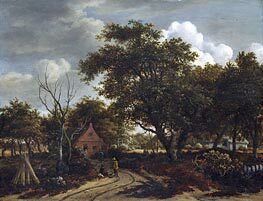 For a considerable period it was profitable to pass Hobbema's as Ruisdael's, and the name of the lesser master was probably erased from several of his productions. When Hobbema's talent was recognized, the contrary process was followed, and in this way the name, and perhaps fictitious dates, reappeared by fraud. An experienced eye will note the differences which occur in Hobbema's signatures in such well-known examples as adorn the galleries of London and Rotterdam, or the Grosvenor and van der Hoop collections. Meanwhile, we must be content to know that, if the question of dates could be brought into accordance with records and chronology, the facts of Hobbema's life would be as follows. 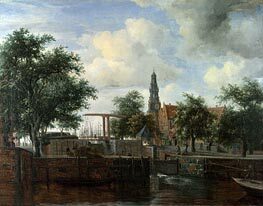 Meindert Hobbema was married at the age of thirty to Eeltije Vinck of Gorcum, in the Oude Kerk (Old Church) at Amsterdam, on 2 November 1668. 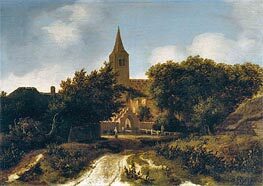 Witnesses to the marriage were the bride's brother Cornelius Vinck and Jacob Ruisdael. 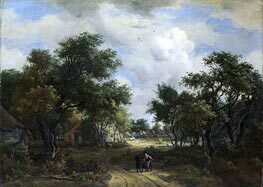 We might suppose from this that Hobbema and Ruisdael, the two great masters of landscape, were united at this time by ties of friendship, and accept the belief that the former was the pupil of the latter. 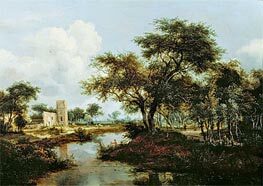 Yet even this is denied to us, since records tell us that there were two Jacob Ruysdaels, cousins and contemporaries, at Amsterdam in the middle of the 17th century - one a framemaker, the son of Solomon, the other a painter, the son of Isaac Ruysdael. 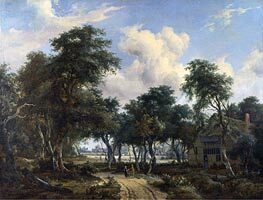 Of Hobbema's marriage there came between 1668 and 1673 four children. 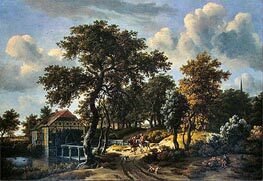 In 1704 Eeltije died, and was buried in the pauper section of the Leiden cemetery at Amsterdam. 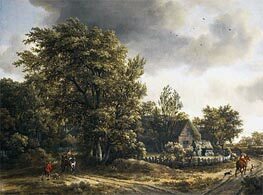 Hobbema himself survived till December 1709, receiving burial on the 14th of that month in the pauper section of the Westerkerk cemetery at Amsterdam. 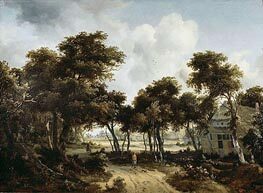 Husband and wife had lived during their lifetime in the Rozengracht, at no great distance from Rembrandt, who also dwelt there in his later and impoverished days. 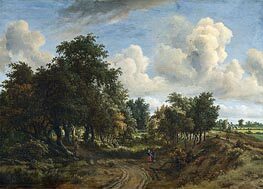 Rembrandt, Hals, Jacob Ruysdael, and Hobbema were in one respect alike. They all died in misery, insufficiently rewarded perhaps for their toil, imprudent perhaps in the use of the means derived from their labours. 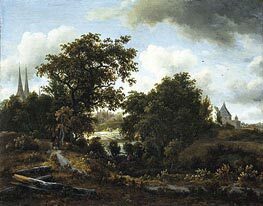 Posterity has recognised that Hobbema and Ruisdael together represent the final development of landscape art in Holland. Their style is so related that we cannot suppose the first to have been unconnected with the second. Still their works differ in certain ways, and their character is generally so marked that we shall find little difficulty in distinguishing them, nor indeed shall we hesitate in separating those of Hobbema from the feebler productions of his imitators and predecessors Isaac Ruysdael, Rontbouts, de Vries, Dekker, Looten, Verboom, do Bois, van Kessel, van der Hagen, even Philip de Koningk. 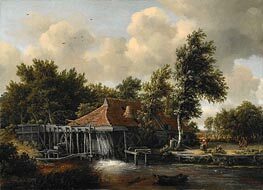 In the exercise of his craft Hobbema was patient beyond all conception. 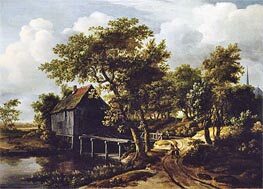 It is doubtful whether any one ever so completely mastered as he did the still life of woods and hedges, or mills and pools. 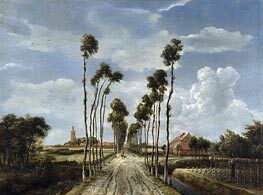 Nor can we believe that he obtained this mastery otherwise than by constantly dwelling in the same neighbourhood, say in Guelders or on the Dutch Westphalian border, where day after day he might study the branching and foliage of trees and underwood embowering cottages and mills, under every variety of light, in every shade of transparency, in all changes produced by the seasons. 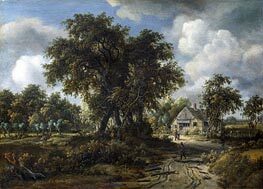 Though his landscapes are severely and moderately toned, generally in an olive key, and often attuned to a puritanical grey or russet, they surprise us, not only by the variety of their leafage, but by the finish of their detail as well as the boldness of their touch. 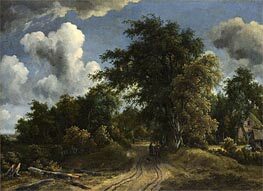 With astonishing subtlety light is shown penetrating cloud, and illuminating, sometimes transiently, sometimes steadily, different portions of the ground, shining through leaves upon other leaves, and multiplying in an endless way the transparency of the picture. If the chance be given him he mirrors all these things in the still pool near a cottage, the reaches of a sluggish river, or the swirl of the stream that feeds a busy mill. The same spot will furnish him with several pictures. 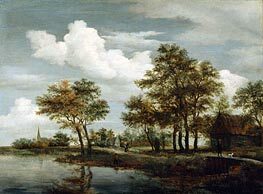 One mill gives him repeated opportunities of charming our eye; and this wonderful artist, who is only second to Ruisdael because he had not Ruisdael's versatility and did not extend his study equally to downs and rocky eminences, or torrents and estuaries - this is the man who lived penuriously, died poor, and left no trace in the artistic annals of his country. 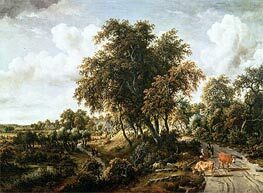 It has been said that Hobbema did not paint his own figures, but transferred that duty to Adriaen van de Velde, Lingelbach, Barendt Gael, and Abraham Storck. As to this much is conjecture. 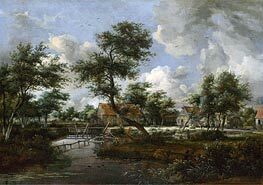 The best of Hobbema's dated pictures are those of the years 1663 to 1667. Of the former, several in the galleries of Brussels and St Petersburg. 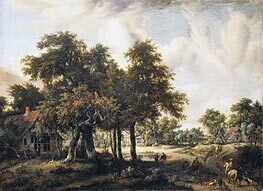 Of several pieces in the National Gallery, including the Avenue at Middelharnis, which some assign to 1689, and the Ruins of Breberode Castle, two are dated 1667. 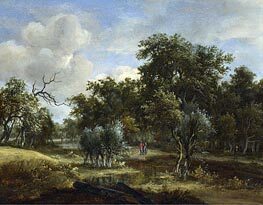 A sample of the last of these years is also in the Fitzwilliam Museum at Cambridge. There are other fine Hobbema's in the Antwerp Museum.